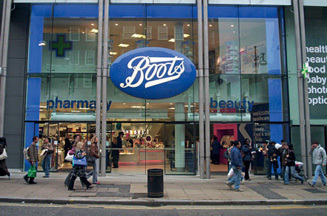 LONDON - Boots will become the first major retailer to accept MasterCard PayPass, which enables customers to make instant payments for everyday items. The contactless payment card's 'Tap & Go' technology allows payment for items under £10 in less than a second. The health and beauty retailer will install MasterCard PayPass technology in 15 of its London stores and six of its Liverpool branches during the second half of this year. MasterCard and Boots are planning a major joint marketing campaign to raise awareness of the technology and encourage consumer use. The two cities were chosen to pilot the scheme after being marked as early adopters of the technology. A one-year MasterCard PayPass trial started in Merseyside in April in a deal between MasterCard, RBS and bus and train operator Stagecoach. MasterCard said this was the first use of contactless bankcard payments on public transport in the UK. Last year Barclaycard issued more than 1m MasterCard PayPass-branded credit cards to UK users.